Clarino™ palm material and durable, two-way stretch material in the thumb make this a great off-road glove as well as a lightweight street glove. • Clarino™ 0.8mm palm material with internal foam padding is ergonomically configured to increase grip comfort. • Durable, two-way stretch material in the thumb, fingers, and top of hand. • Clarino™ panels are strategically located on the thumbs to help resist wear from grip flanges. 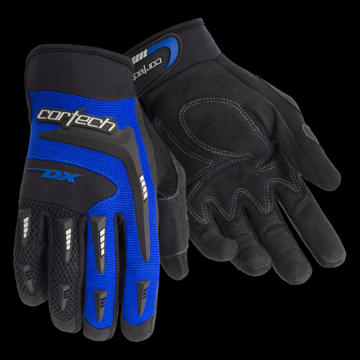 • Neoprene knuckle and wrist panels provide flexible comfort and roost protection. • TPR molded finger, top of hand panels and cuff closure.